Working with what is there; Before, during and after! 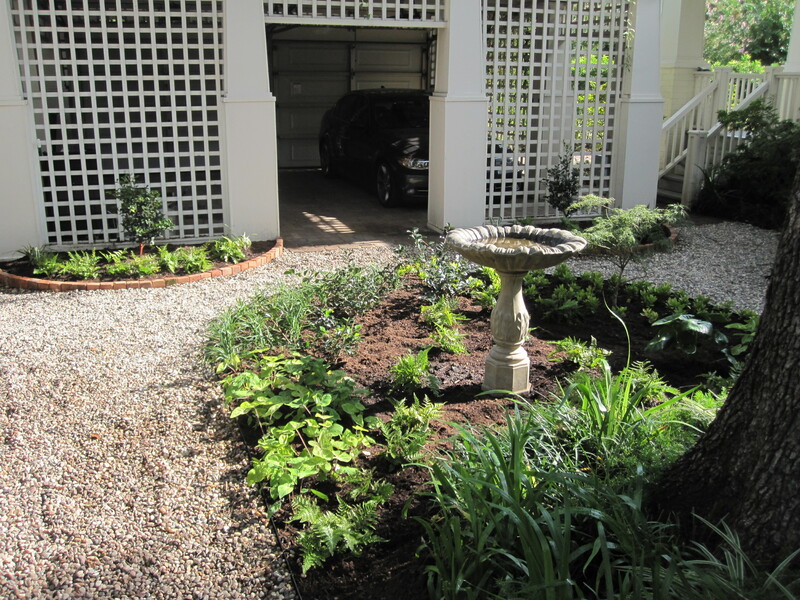 A refresh garden for a lovely cottage! 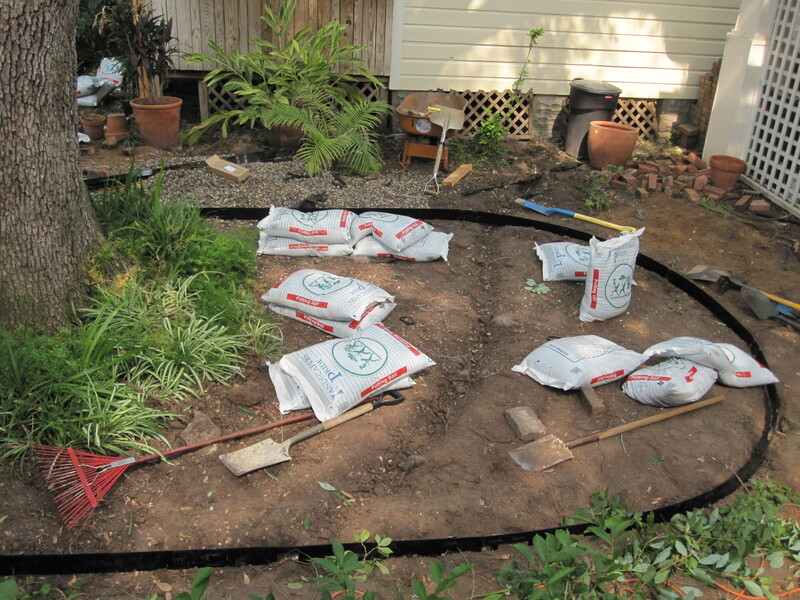 There are all kinds of landscaping projects. 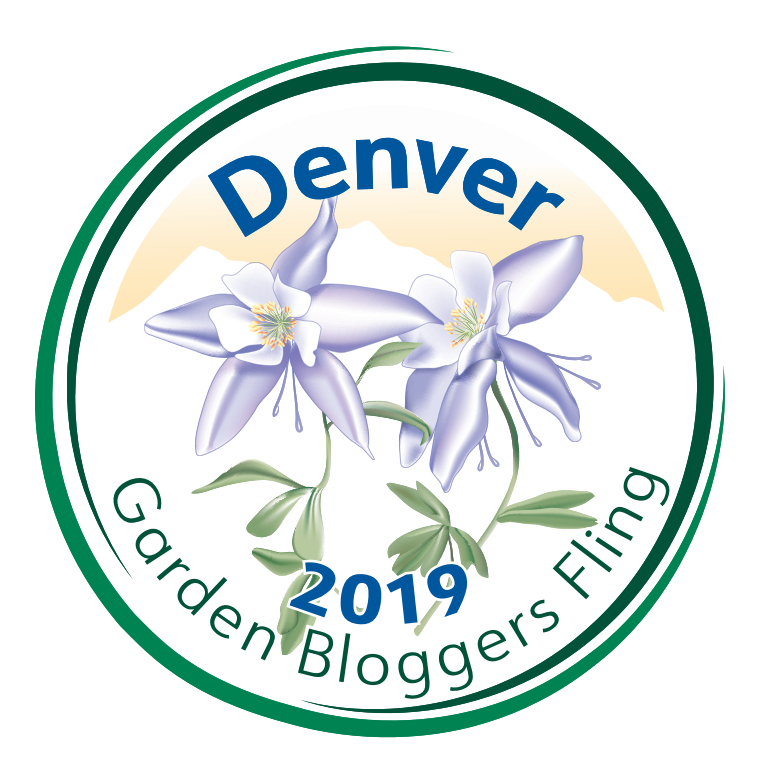 The ones I find the most challenging are the gardens with lots of established plants that have become overgrown and the whole garden needs a refresh. Where to start, what to edit, what to keep…what direction to take it in? 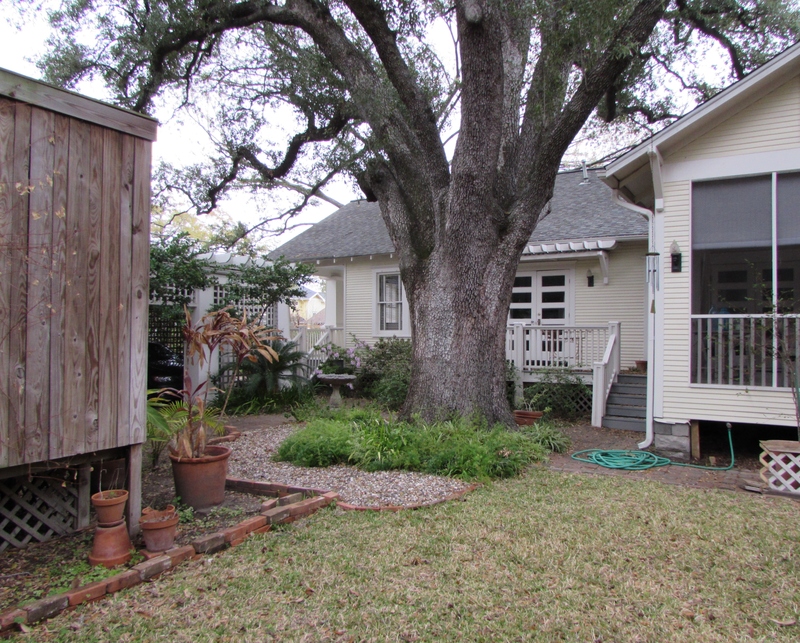 Our latest project was around a lovely vintage cottage here in the Heights. 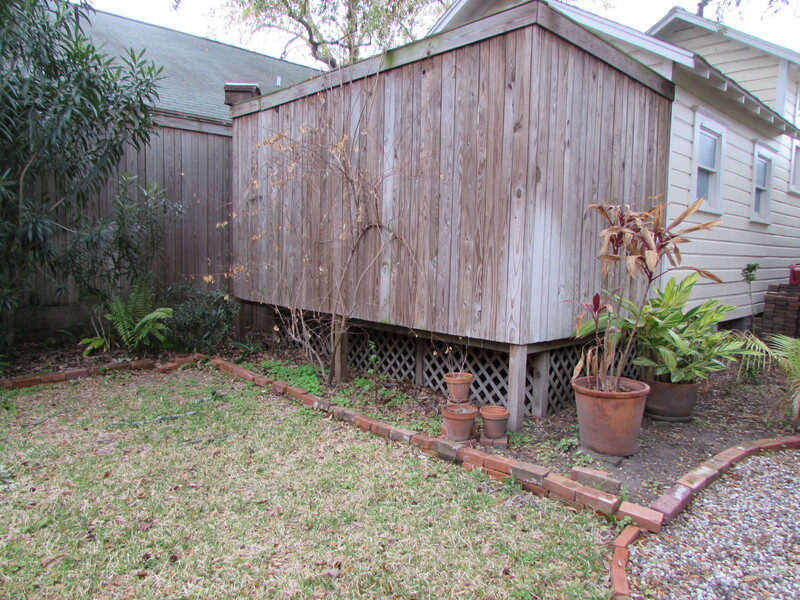 It has a nice corner lot with a wrought iron fence on two sides and garden on three. 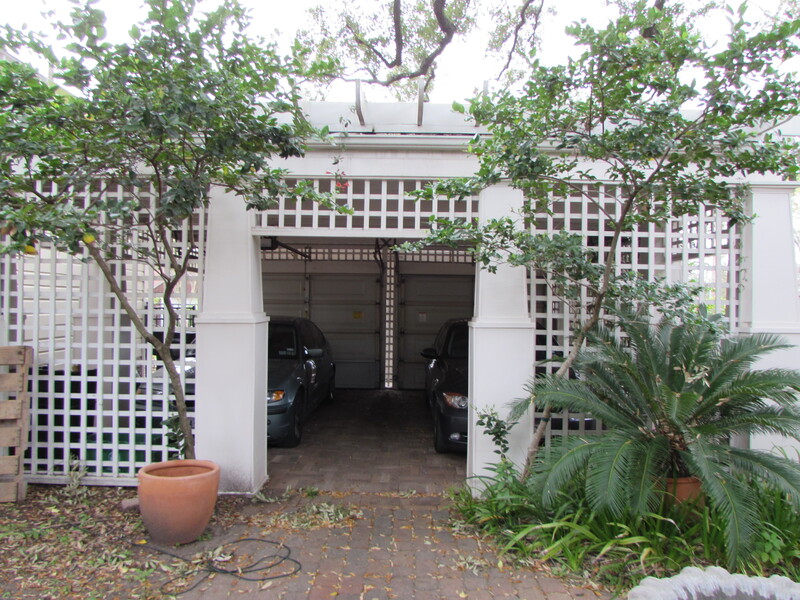 The old garage had been turned into a little rental cottage and a carport built next to it for off-street parking. 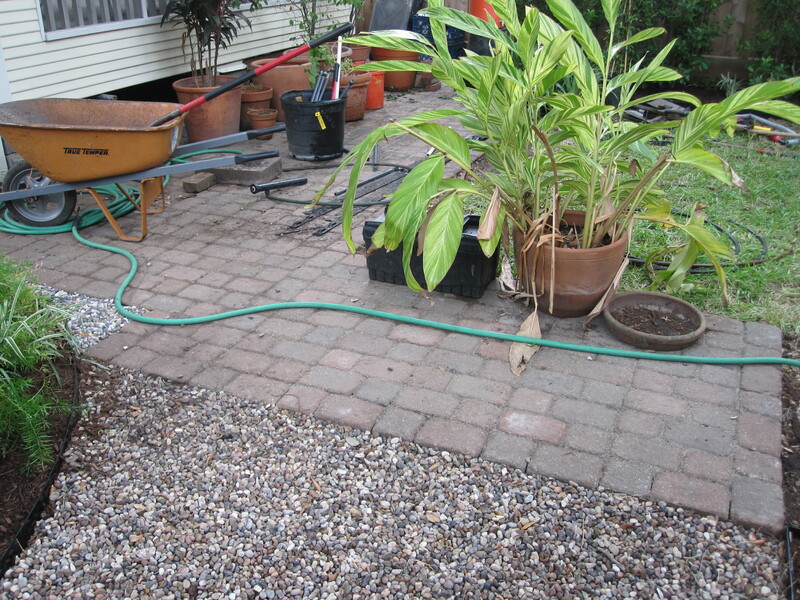 Old paver paths had become uneven and the overall look of the garden was a bit messy. 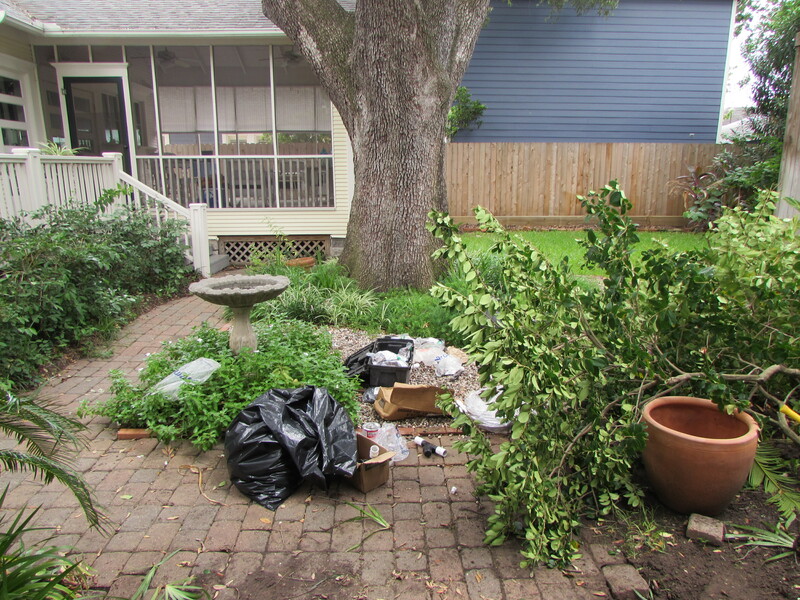 The previous owners had taken out lots of specimen plants and what was left needed filling in. Before of master bedroom and fence to east. 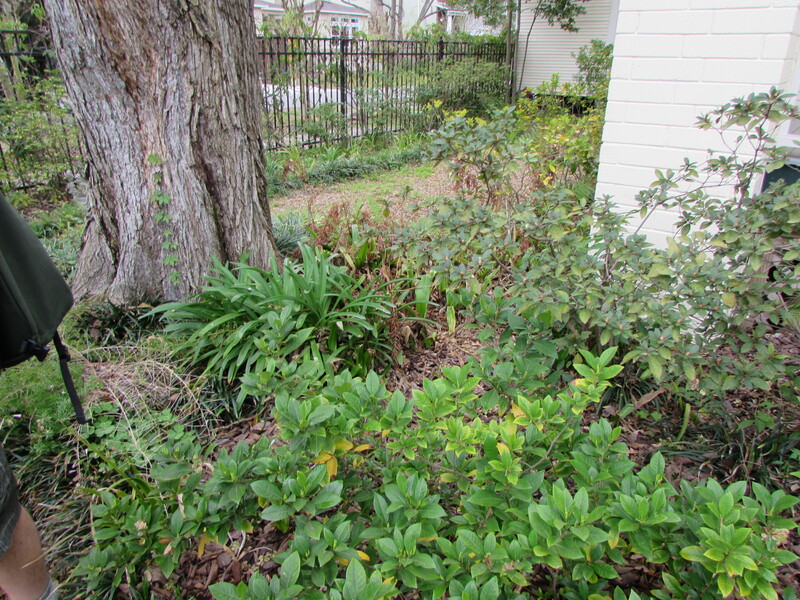 There were great plants, mostly southern acclimated plants like lilies, mahonia, azaleas and two big oleanders. They just needed TLC. 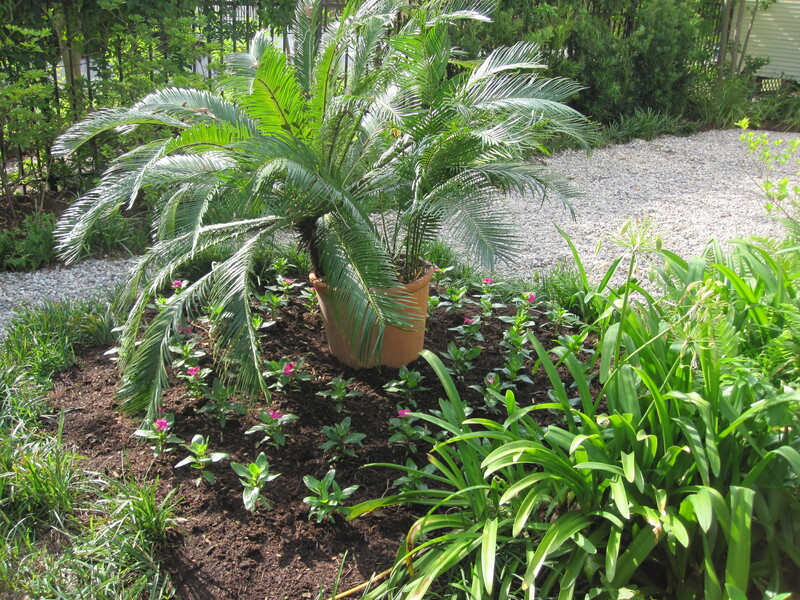 I decided to stay with the southern theme and bring in more southern acclimated plants like crinum lilies, spider lilies, ferns, camellias and gardenias that do well in our Houston clay soil and humid climate. The pavers under the big oak tree where becoming a trip hazard so I decided to re-purpose them into a little patio and BBQ area to the west of the screen porch just off the lawn. This allowed us to change the shape of the bed around the oak. 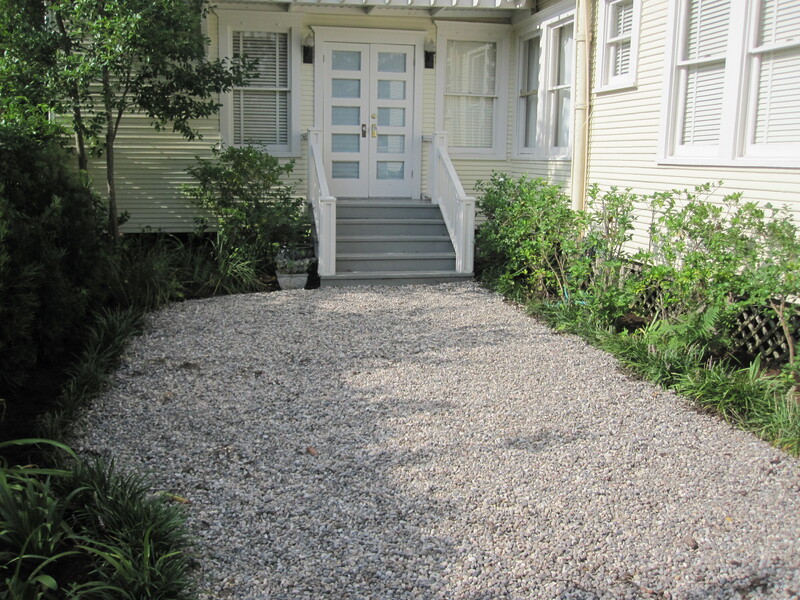 I used rainbow gravel instead of pavers so we could get as much rain water as possible to this big beauty! 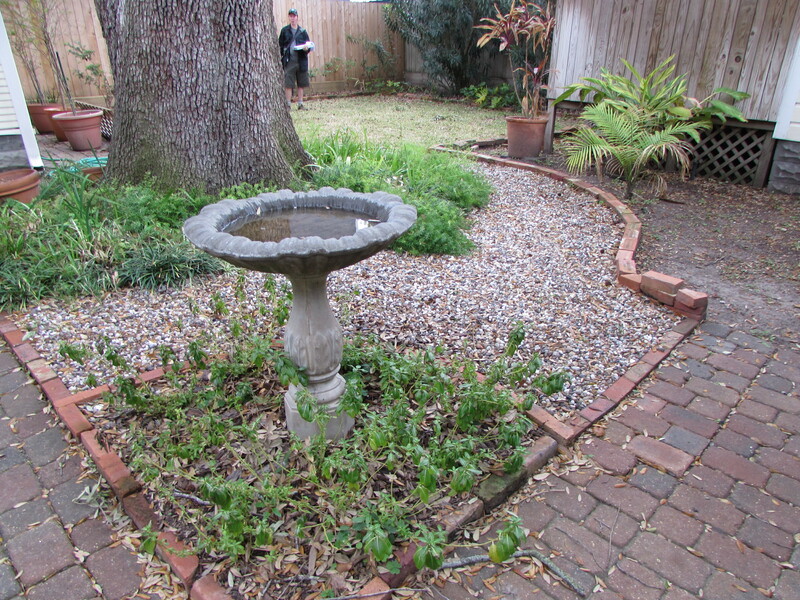 The uneven pavers, various hardscape materials, and shallow soil beneath the lovely oak tree created a challenge. Looking from the carport opening to the screened in porch. 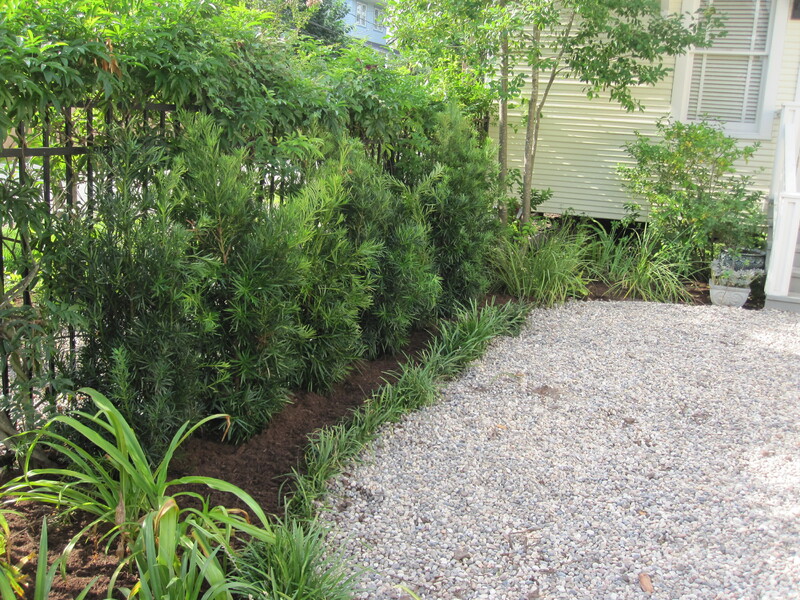 On the east side of the house off the Master bedroom we made a privacy hedge with Japanese Yews; they will get morning to mid-day sun and then be shaded by the giant oak on the other side of the house. 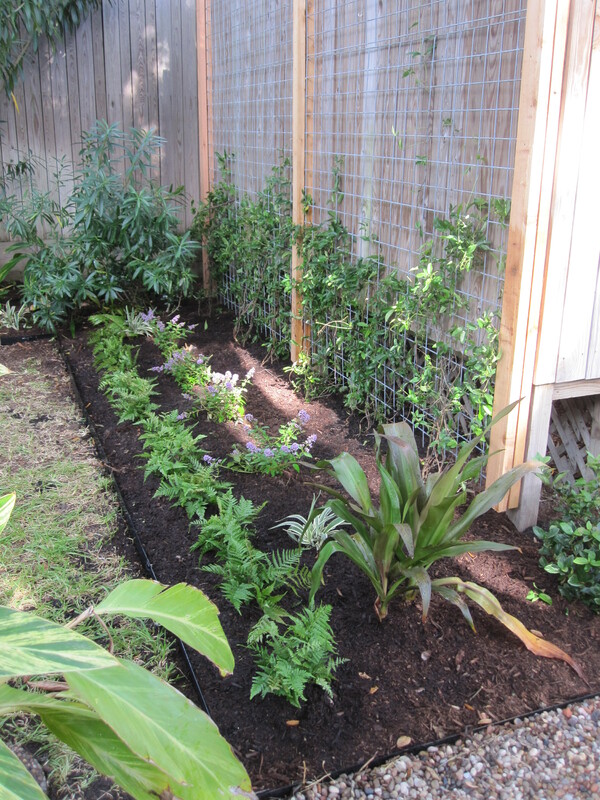 Our plan is to enclose this space with a lattice screen and create a private garden. The owners weren’t quite sure so I suggested we clean up the area, create beds and put down gravel and let them live with that for a while. We can always come back and finish it. When we were first there we talked about the health of this old Pecan. 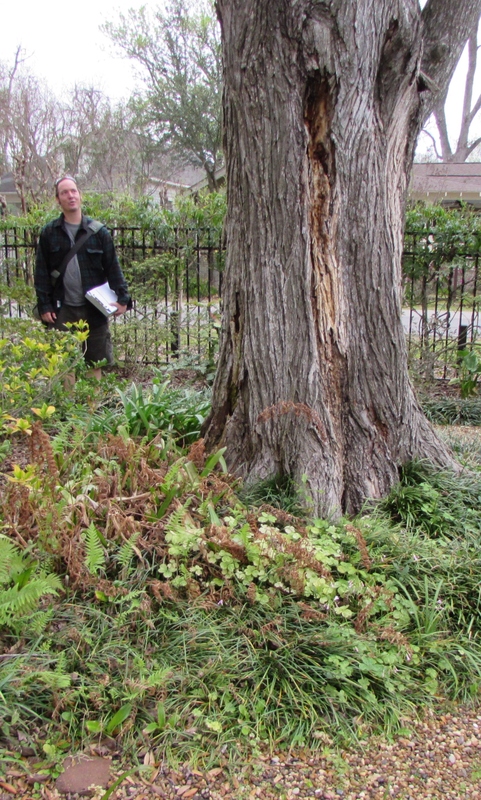 In the end the arborist said it was too far gone to save. This opened up the space to more light and possibilities. 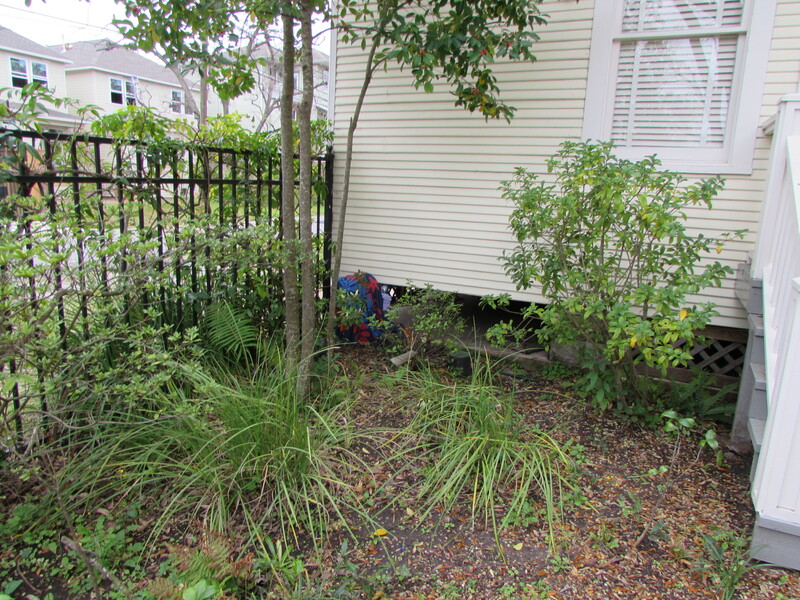 The owners were a bit overwhelmed with all the changes so for now we moved the big Sego that was behind the carport to where the tree used to be and dressed up the bed with annuals. Sego with vincas. 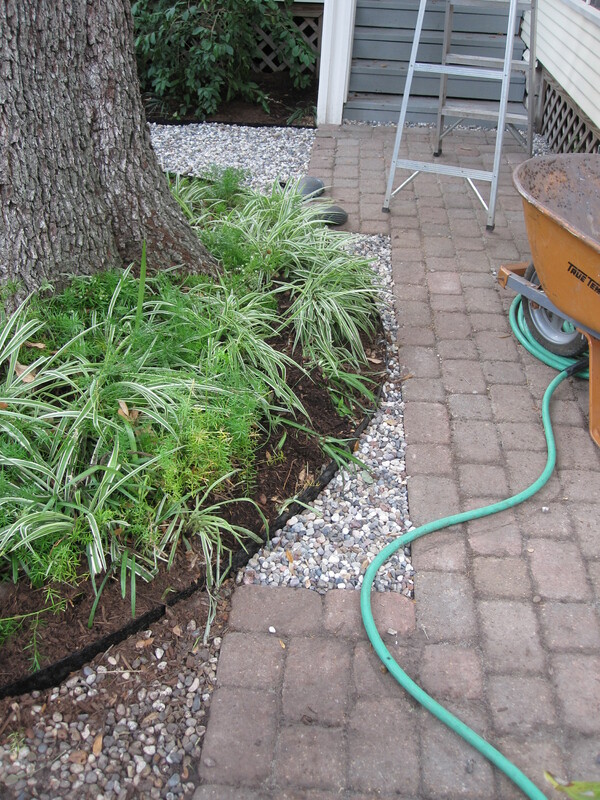 We prefer to wait at least a year before we plant larger perennials where the tree used to be. 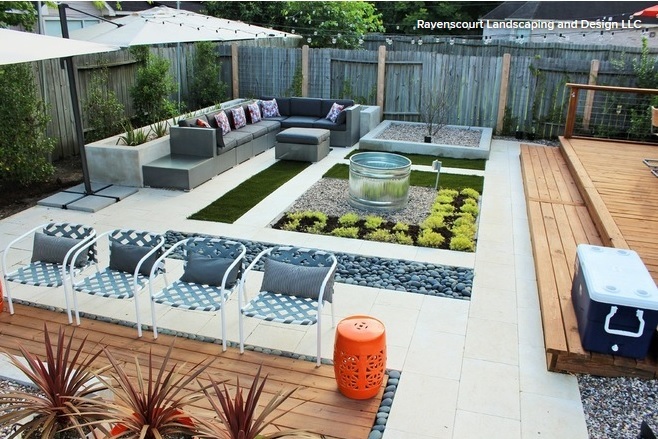 Gardeners have the luxury of letting their gardens evolve as they play and change their minds. 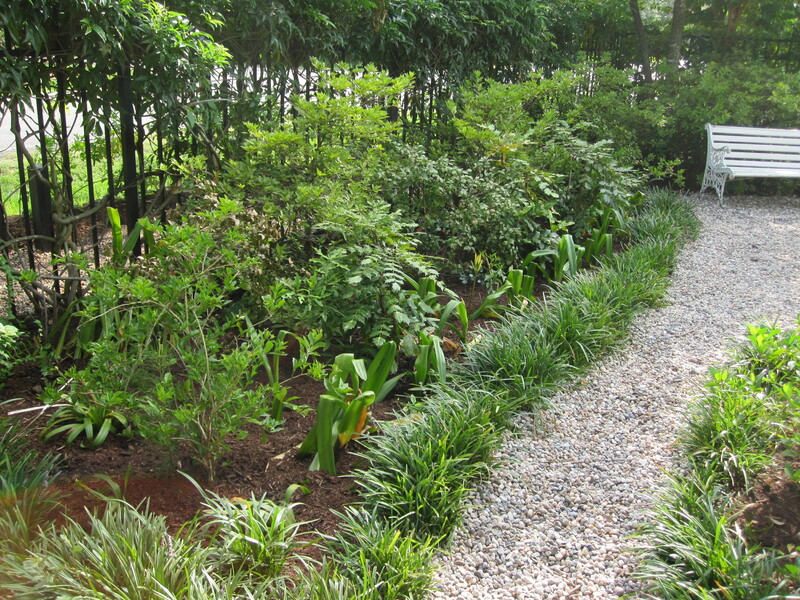 When people hire professional landscapers they usually want to have it done all at once. As much as possible I try to leave room for phases especially to help customers with budgeting. Redefining the beds. Notice the dark line running through the bed. This is the water line to the garage apartment. We were sure to avoid disturbing this pipe! Changing the paths to rainbow gravel. Much more cohesive look. All that is missing is the swath of annual in front of the Waterfall Japanese maple. When we come to a property we inventory what is there so we can reuse it if possible. The pavers where fine just not installed well. We found them a nice new home that gives the owners a place to cook outside. 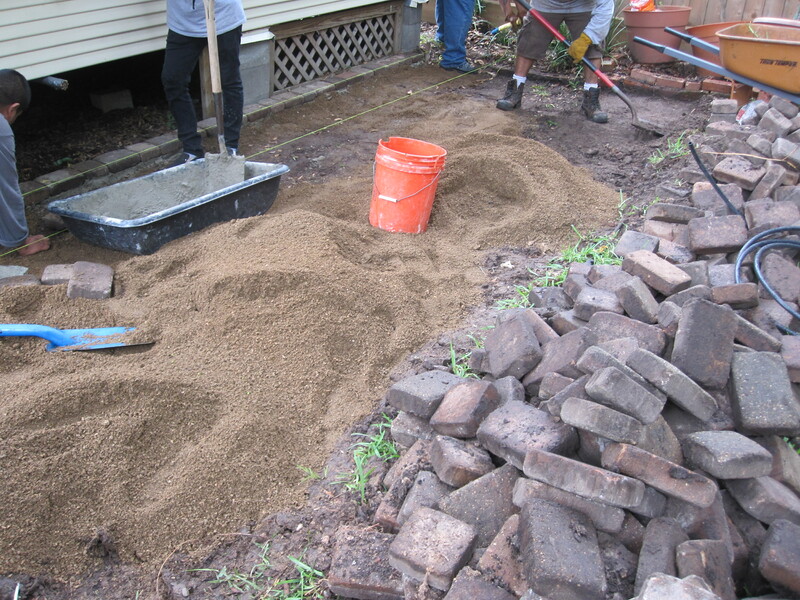 Reusing the pavers we took up near the carport. Newly laid paver walk that working around the oak tree roots. 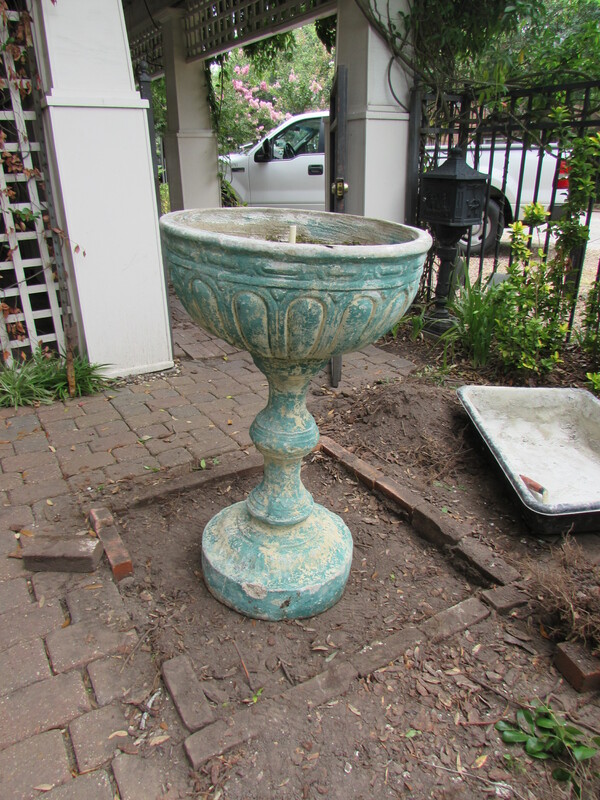 An existing fountain waiting for its new basin and location. The fountain is centered on their front steps and just waiting for new rocks to hide the basin. They plan to put a cafe table and chairs here for another seating area. 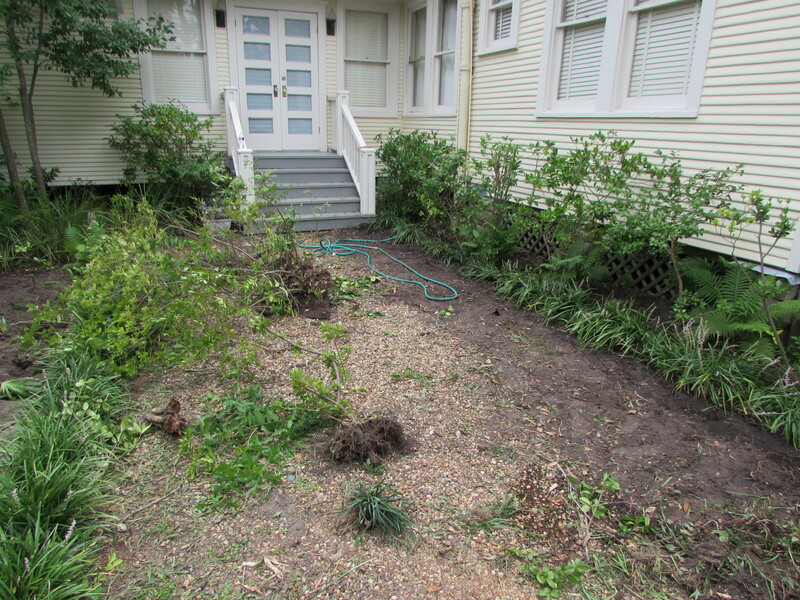 The beds against the north fence were sparse, cleaning them up and infilling made a big difference. 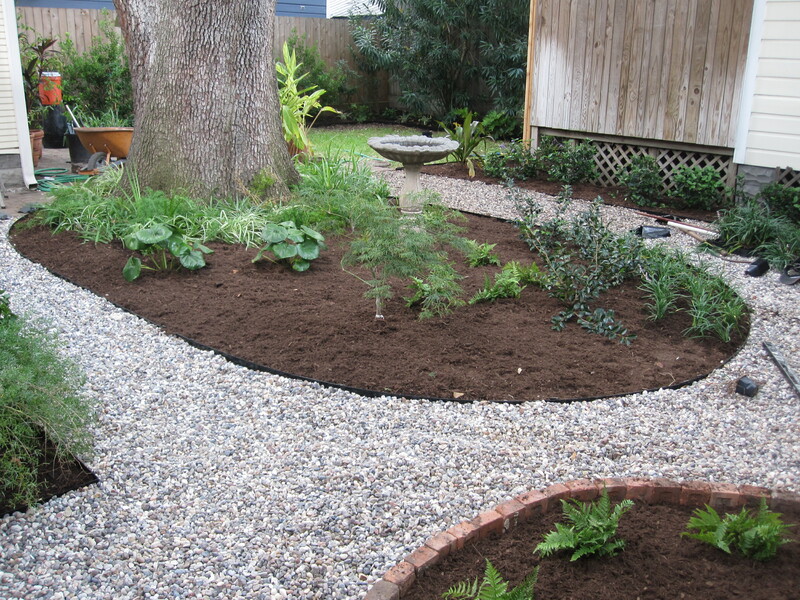 We also refreshed the gravel path. 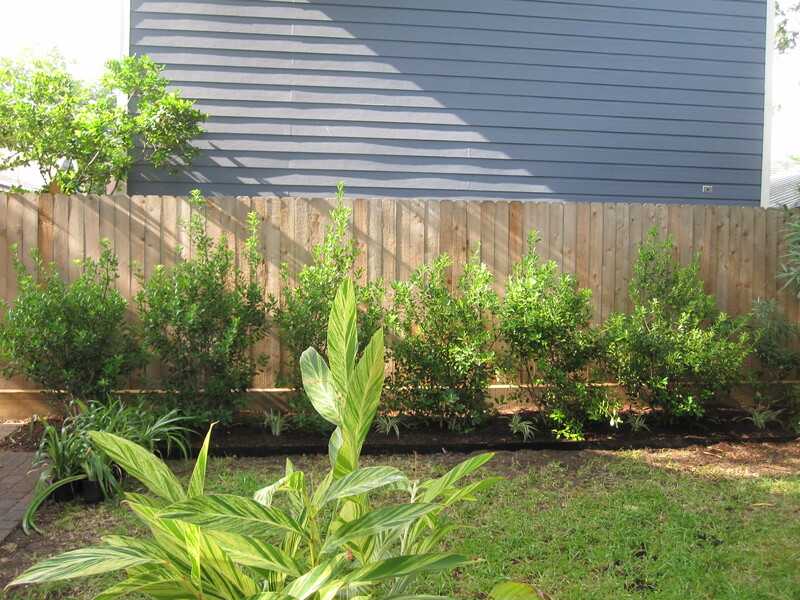 The little rental cottage’s deck protrudes into the garden area and sound carries both ways so we are growing lush evergreen Tangerine crossvines on the welded wire we installed. 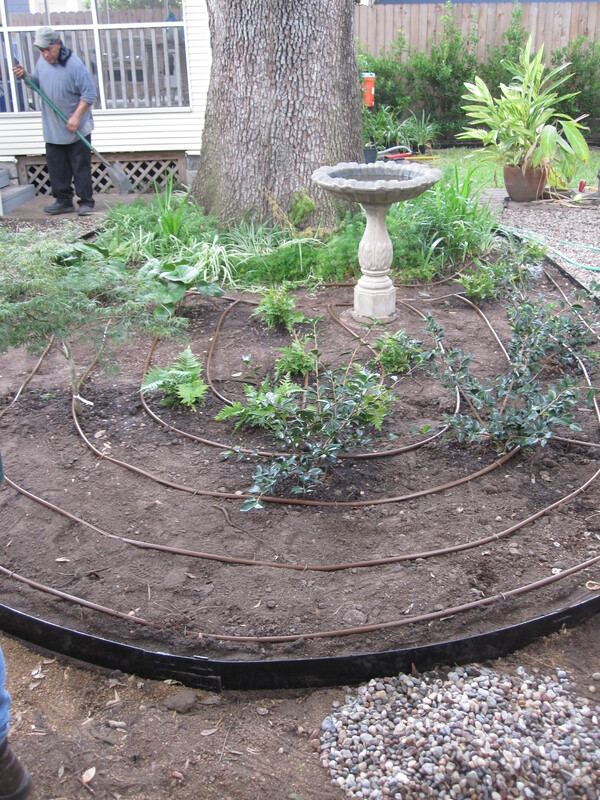 Welded wire trellis with vines to increase the privacy for the tenant in the rental cottage. 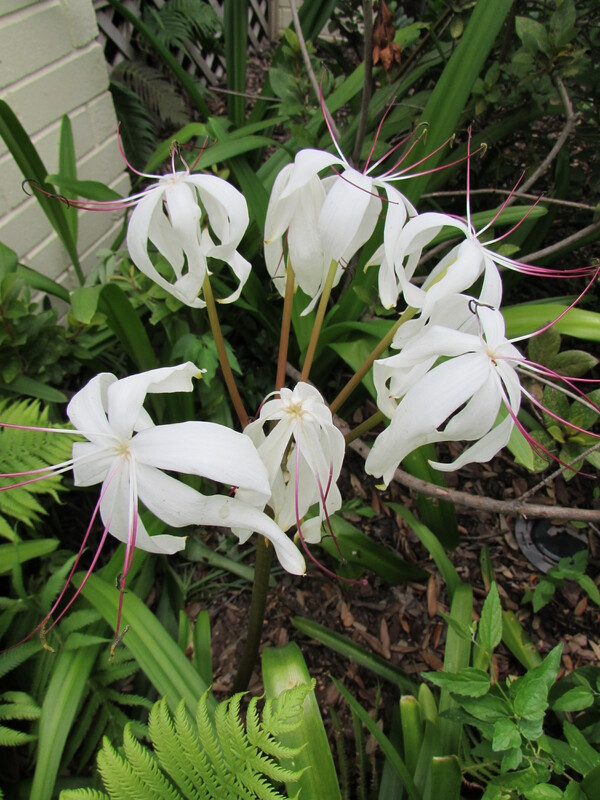 A lovely Queen Emma crinum will fill the corner and become a lively focal point. Taking out the old pavers meant we could make a more dramatic entrance to the garage opening. We matched the curves of the oak bed. 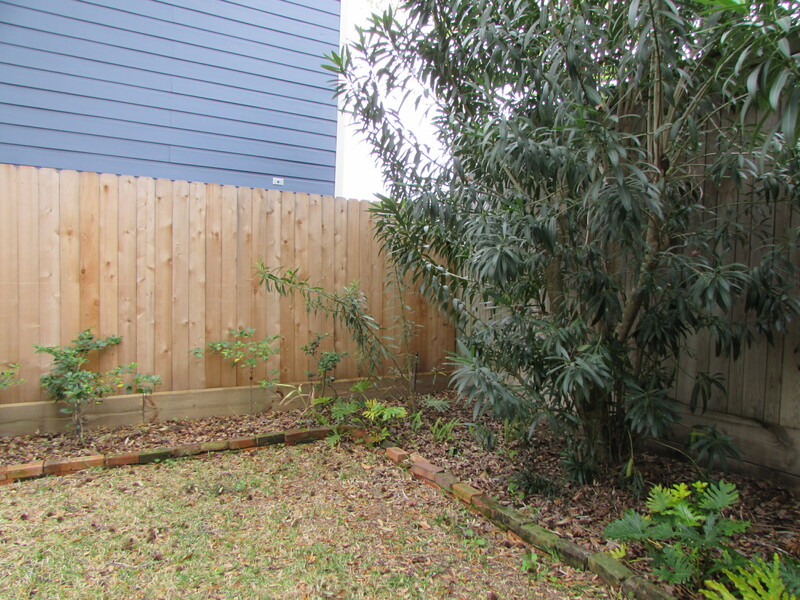 We took out the spindly ligustrum that were not well placed and put camellias centered on the panels. They are tiny now but will be lovely in a few years. The screen porch looks out across the oak bed and to this area. Professor Sargent camellias flank the garage opening. Below is another privacy screen. The neighbor’s garage looms over the back lawn area and the owners really don’t like looking at it. We planted Savannah hollies because they are very adaptable and don’t want to be overly wide even when they are 20 feet tall, plus take shaping very well. Before, we keep the large oleanders that keeps out the late afternoon sun. 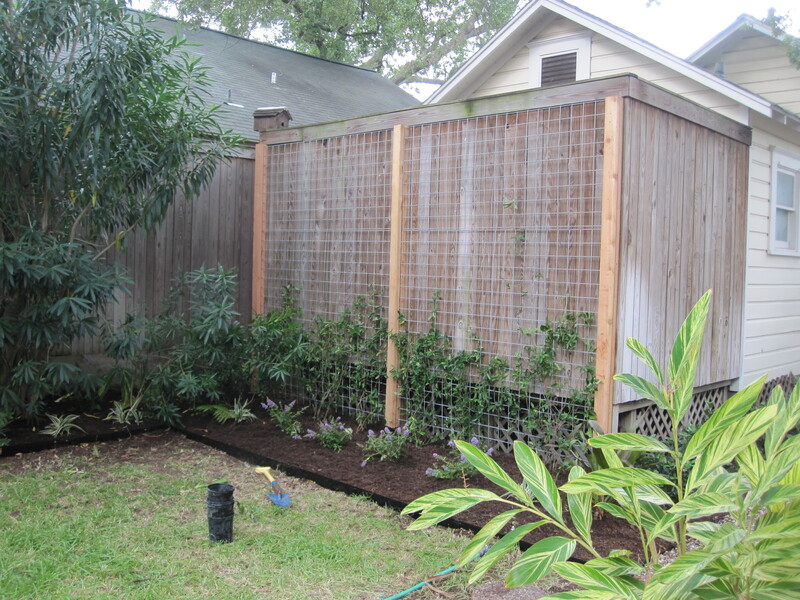 Screen of Savannah hollies that will soon block the view of the neighbors garage. The homeowners were very pleased with the transformation and we finished just in time for the expected baby’s arrival this weekend! 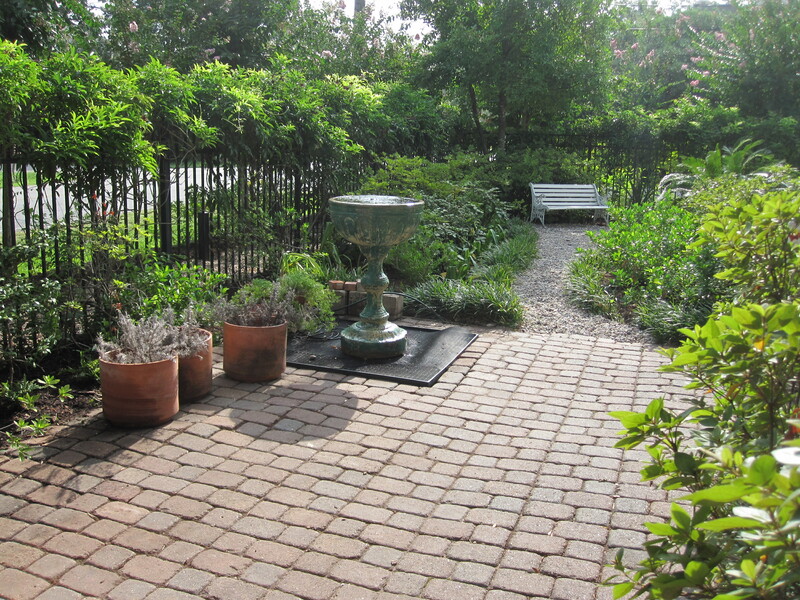 We are pleased for them and happy to help them achieve a welcoming (and low-need) garden. 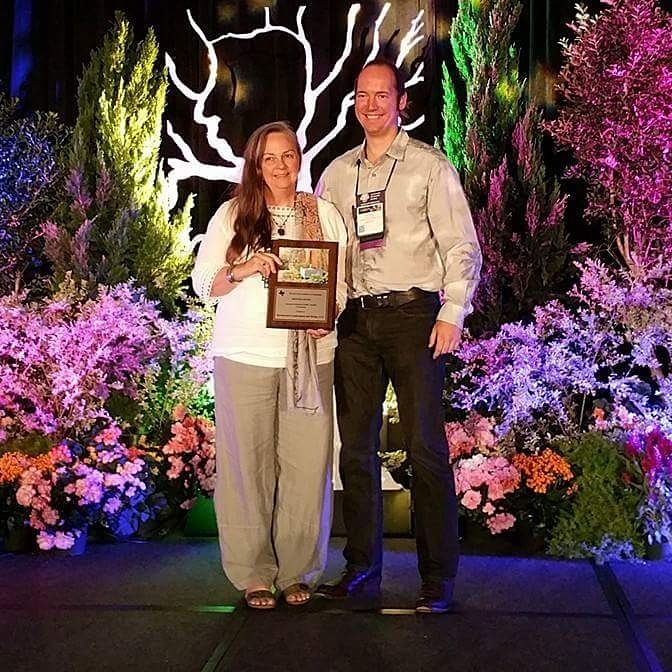 Laurin, love the changes you made to this garden! Beautiful transformation! 🙂 The gravel is so much easier to maintain than grass. Thank you CM…I like gravel too!